CINCINNATI -- Auditors last summer found that two city agencies had wrongly billed taxpayers for thousands of dollars. Yet the city never collected any of the combined $43,238 that Keep Cincinnati Beautiful and the Center for Closing the Health Gap improperly charged for -- until last month, the same week WCPO began asking about the payments. WCPO’s investigation also found the city manager never made the changes auditors said would safeguard those taxpayer dollars in the future. Keep Cincinnati Beautiful for months has owed $19,632 to the city, while the Health Gap has carried a debt of $23,654. The money went uncollected even as City Manager Harry Black implemented a hiring freeze and warned of a $25 million projected deficit in the city’s upcoming budget. Cranley is now vowing to change how human services groups, like the Health Gap, get city money. "I can assure you that when I submit a budget to council in June of this year, that I will make it explicitly clear in the legislation that any monies for this kind of thing will go through a competitive process where everyone is treated the same," Cranley said. Keep Cincinnati Beautiful, which is slated to receive $497,711 from the city this year, made a single $2,094 payment toward its debt on Jan. 17 -- nearly six months after an audit uncovered the agency billed for unperformed work. The Center for Closing the Health Gap, which will collect $750,000 from the city this year, repaid nothing toward its $23,654 debt as of Jan. 30 -- nearly nine months after an audit revealed questionable billing practices and charges to the city for political action work. The Health Gap’s debt went uncollected because the employee in charge of their contract was out on extended sick leave, Black said. “It got lost. They dropped the ball, but the ball has been picked up,” said Black, who gave his assurances that the city would subtract the money from the Health Gap’s January payment. That outstanding debt is separate from $17,822 in expenses the Health Gap submitted to the city for reimbursement from March through August 2017, which the city disallowed. The Health Gap and Keep Cincinnati Beautiful were the only two city-funded outside agencies the city audited in 2017. Improper spending was found in both cases. And in both cases, the city vowed to re-write their contracts and hold all nonprofits to higher standards . But WCPO discovered that nearly a year later, the contracts with both agencies remain nearly identical. “It’s the city’s fault that we’re not getting this right,” said former City Councilman Kevin Flynn, who led efforts to change how the city contracts with outside groups before he left council in December. In May 2017, board leaders at Keep Cincinnati Beautiful placed the nonprofit’s executive director on leave , alerted the city of possible improper spending at their agency and asked the city to perform an audit. The nonprofit promotes litter prevention, recycling and citywide cleanups. Their audit found the former director had lied about hours worked, and the city ultimately paid for it . It pointed out the need for better internal controls and criticized the city for “minimal” oversight and “lack of training” for contract administrators. The city never amended its contract with Keep Cincinnati Beautiful to add any protections, despite the scathing audit. The five-year contract, which has been amended before, has gone unchanged since 2016. But changes are happening at Keep Cincinnati Beautiful in the wake of the audit, interim director Marissa Reed said. The agency also agreed to a monthly plan to repay its debt to the city through February 2019. Mayor John Cranley called for an audit in March 2017 after a two-month WCPO investigation found the Center for Closing the Health Gap , which is tasked with improving minority health in poor neighborhoods, was billing the city for questionable expenses. Former Cincinnati mayor Dwight Tillery leads the Health Gap, which has collected more than $4.5 million in city funds over the last decade. When the audit was released in May 2017, it revealed the city’s contract with the Health Gap was too vague, oversight was too lax and several contract terms were unfulfilled. This Center for Closing the Health Gap healthy corner store in Walnut Hills did not have fresh produce when WCPO visited in late January 2018. Black promised, in the wake of the Health Gap’s audit, to give all nonprofits a sharper look. But those changes never happened. Black signed the Health Gap’s newest contract with the city in October. It contains identical performance metrics compared to the prior contract -- ignoring the auditor’s criticism that the terms were so vague they were unenforceable. Black said he tried to present the Health Gap with new contract terms after the audit in 2017, but the nonprofit’s leaders balked and called the process "unfair." Black agreed, and his office changed the contract back to its original terms. As a result, Black only made one change in the Health Gap’s new contract -- adding a clause reserving the right to “unilaterally go in and make changes,” for any reason, giving the city an added layer of protection, he said. The city has not responded to WCPO’s request for the draft contract. The Health Gap declined to comment, and directed questions to the city manager’s office. Black insists that he’s done nothing wrong, and neither has the Health Gap. “Let me be clear: There is nothing that supports the idea that the Center for Closing the Health Gap is out of compliance with this contract,” Black said. 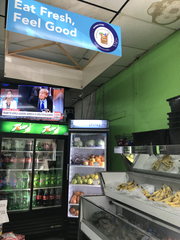 This Center for Closing the Health Gap healthy corner store in the West End was stocked with produce when WCPO visited in late January 2018. But Cranley saw things differently. After an interview on Feb. 2 when WCPO revealed its findings to Cranley, he immediately wrote an email to Black, questioning both agencies’ contracts. That’s a concern that Flynn shares. He said he wonders what the city would uncover if it audited every outside group that gets taxpayer money. When the Health Gap signed a contract with the city in 2016, it promised at least 11 convenience stores in poor, urban neighborhoods would stock fresh fruits and vegetables. A place where people living in food deserts could find a fresh apple or carrots. 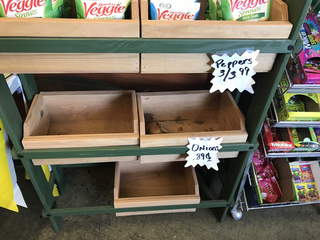 Yet when WCPO visited those stores in March 2017, only three were stocked with a variety of fresh fruits and vegetables. Other places did not have any produce in stock or workers said they did not participate in the program. “In terms of that particular element of the contract -- they were lacking,” Black said when WCPO asked about the lack of fresh markets during a May 2017 interview. Nearly a year after the investigation, WCPO reporters returned to the Health Gap’s 14 healthy corner stores in late January 2018 to see if anything had changed. The Health Gap, as part of its November 2017 annual report, provided the city a list of 14 corner markets it was supposed to be operating. But only five of the stores were stocked with a variety of fresh produce. 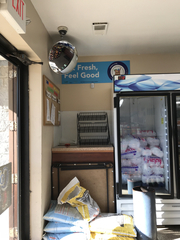 Some store owners said the Health Gap has been helpful, providing new refrigerators for produce and suggestions for which vegetables to stock up on. 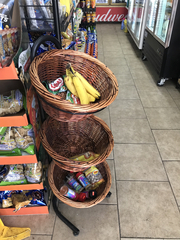 A Center for Closing the Health Gap healthy corner store in Evanston only offered bananas when WCPO visited in late January 2018. One store was closed. 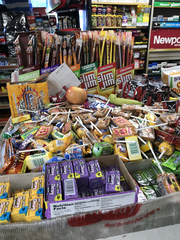 In another store, a lone apple and banana sat atop a pile of candy. Several others had empty bins. A few owners said they don’t stock produce because customers rarely purchase it, so it gets thrown out. WCPO showed Cranley photos of the stores from recent visits. But Black said he does not believe the lack of fresh produce in stores is a violation of the Health Gap’s contract with the city. The city’s contract with the Health Gap specifically says they are to maintain 11 to 14 healthy corner stores. But that is a goal, “something softer” and not a quota, Black said. The Health Gap is just required to provide education and awareness -- not stock shelves, Black said. This Center for Closing the Health Gap healthy corner store in Avondale had signs, but no produce when WCPO visited in late January 2018. The city’s contract says otherwise. “Corner Store initiative to provide access to healthy and fresh foods in the food desert areas in the city,” states the contract Black signed in October. Cranley wonders if the $750,000 the city is paying the Health Gap this year -- more than any other single outside agency receives -- could be better spent elsewhere. “Well, based on what I know -- which is promising to put out fresh fruit and not doing so -- that seems like a waste of money when we have police, fire and basic services that we’re trying to make sure that we don’t have to cut back on,” Cranley said. Councilman Kevin Flynn introduced a motion in June 2017 to tighten how the city awards money to nonprofits. The motion, which won unanimous approval from all nine council members, asked the city manager to change the contracting process. Instead of allowing each agency to create its own contract goals, the new motion would let the city determine what services it received in return for the hundreds of thousands of taxpayer dollars it spent. Flynn’s motion was explicit: All money that city council awards to outside groups would be withheld until the city manager completed a rigorous examination -- called PartnerStat -- of the nonprofits. After completing PartnerStat, each contract would come back to city council for final approval, according to the motion. But none of that ever happened. Contracts were signed and taxpayer money was sent to the organizations. The city manager signed a new contract with the Health Gap in October 2017, without ever bringing it to city council for final approval. Mayor John Cranley asked that same question in his email to Black last week. “Why wasn’t the contract brought to Council before it was signed,” Cranley asked in the email. But Black says council’s motion does not carry any legal weight to force a change. He said the city manager’s office routinely brings economic development contracts to city council for final approval. He does not believe Black has the authority to write contracts that spend city money without any input from city council. 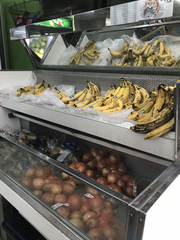 This Center for Closing the Health Gap's healthy corner store in Walnut Hills only had a single apple and banana, when WCPO visited in late January 2018. Black said his office, “as a compromise,” has brought to city council plenty of information from the PartnerStat sessions it has with nonprofits. And Assistant City Manager Sheila Hill-Christian did brief city council in December 2017 about agencies that had gone through recent PartnerStat sessions. But the Health Gap still has not had one of those review sessions with the city for its new contract. The city had scheduled another PartnerStat session with the Health Gap in late 2017, but the city had to cancel that session and it was never rescheduled, Black said. In fact, none of the nonprofits has undergone one of these sessions to examine their new contracts signed in the fall of 2017, Black said. A session with the organizations will be scheduled in the coming weeks to review current contracts, Black said. For his part, Flynn is confused and disappointed.